This is so delicious and great in the summer. Can be made ahead and freezes well. Cut a 2-inch deep slice across the top of the cake. Remove the piece and reserve. Cut a bowl from the interior of the cake, leaving walls and bottom of cake at least 1 inch thick; you’re creating a cavity for the filling. Dice 1 cup strawberries. Soften gelatin in 1Tbsp cold water. Mix with 2 Tbsp boiling water until dissolved. Add to strawberries. Whip cream with powdered sugar. Stir in vanilla. 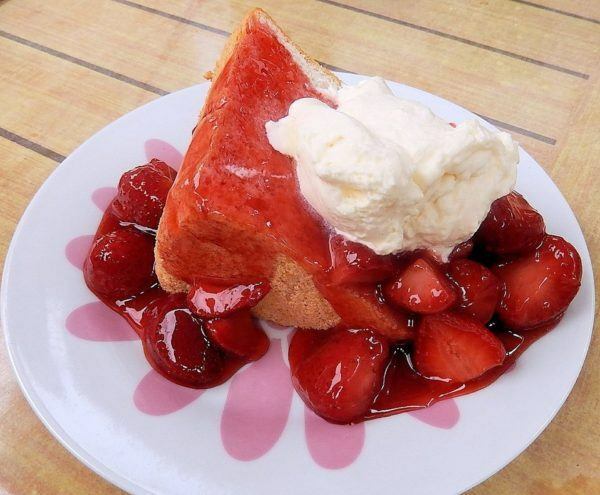 Place half the whipped cream in a bowl and fold in strawberries. Reserve remainder of whipped cream for frosting. Fill the cavity of the cake with strawberry/whipped cream mixture. Place circle back on top of the cake. Let sit in refrigerator for an hour, then freeze. Once frozen, cover with remaining whipped cream. Remove from freezer 30 minutes before serving. Place on platter. Decorate around the base with strawberry halves and fresh mint.